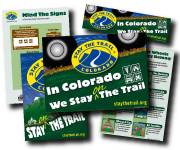 To promote our responsible trail use message, Stay The Trail Colorado has developed educational materials including brochures, videos, posters, billboards, and podcasts. Click on a publication type below to view, download, print, watch, or listen to our available publications of that type. 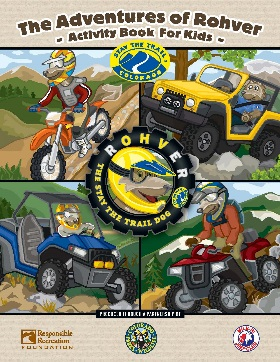 Individuals can order their Educational Material HERE! If you are Organization/Club or Vendor wanting to order Educational Material please fill out the short questionnaire located HERE and we will send you the appropriate link for ordering. 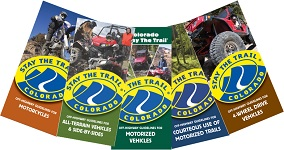 This award recognizes innovative & successful trail sharing efforts, programs, & systems. American Trails' 21st National Trails Awards Program honors people and programs at the 21st American Trails International Symposium. 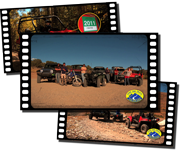 The awards celebration was held at Fort McDowell Yavapai Nation, Arizona, April 16, 2013.